More than 30 Khet Udomsak kids competed in the sub-district’s first band and singing contest. Mayor Pairoj Malakul and other elected officials were on hand for the Aug. 11 finals of the Children’s Music & Singing Contest at city hall. 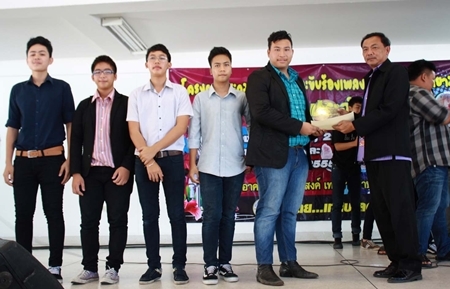 The contest was split into four categories with grade school, junior high and high school students competing in belting out Thai and international songs and groups of youths battling it out in the band category. Seven primary school students, 14 junior high and 9 high school students competed, along with eight bands. One of the contestant bands performs during the Khet Udomsak Children Music & Singing Contest 2012. Finalists were selected after three preliminary rounds in July, with judges from the Sattahip Navy Marching Band and Sattahip Thai Classical Art Club helping choose winners. Winners in the contest celebrate with Khet Udomsak Mayor Pairoj Malakul.